Forests across the United States are expected to undergo numerous changes in response to the changing climate. 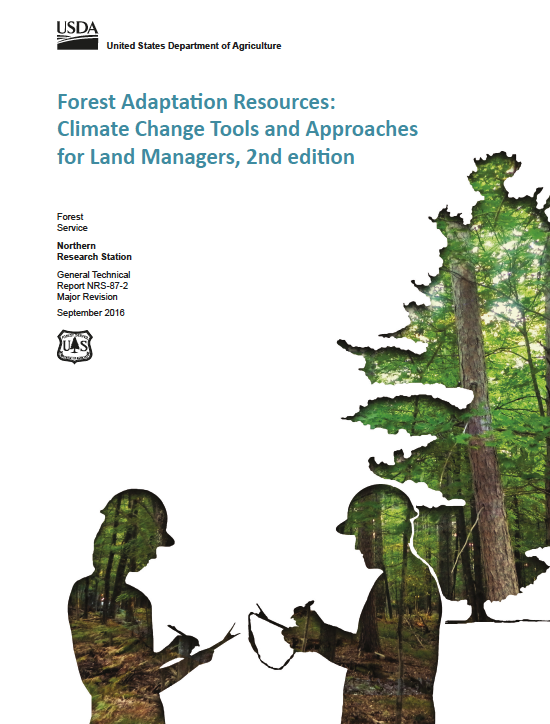 This second edition of the Forest Adaptation Resources provides a collection of resources designed to help forest managers incorporate climate change considerations into management and devise adaptation tactics. It was developed as part of the Climate Change Response Framework and reflects the expertise, creativity, and feedback of dozens of direct contributors and hundreds of users of the first edition over the last several years (see http://dx.doi.org/10.2737/NRS-GTR-87). Six interrelated chapters include: (1) a description of the overarching Climate Change Response Framework, which generated these resources; (2) a brief guide to help forest managers judge or initiate vulnerability assessments; (3) a "menu" of adaptation strategies and approaches that are directly relevant to forests of the Northeast and upper Midwest; (4) a second menu of adaptation strategies and approaches oriented to urban forests; (5) a workbook process with step-by-step instructions to assist land managers in developing on-the-ground climate adaptation tactics that address their management objectives; and (6) several real-world examples of how these resources have been used to develop adaptation tactics. The ideas, tools, and resources presented in the different chapters are intended to inform and support existing decisionmaking processes of multiple organizations with diverse management goals.